Now it seems like a dream | carpe diem! But I have more than memories. When I was trying to decide whether to try for SOAR I spent a lot of time googling for hard information about it. What actually happened? OK, it was clearly memorable, even life-changing, and people had fun and drank a lot, but what did they learn? Having been, I now understand why it’s so hard to describe. Yes, you learn, or at least I did. A lot. 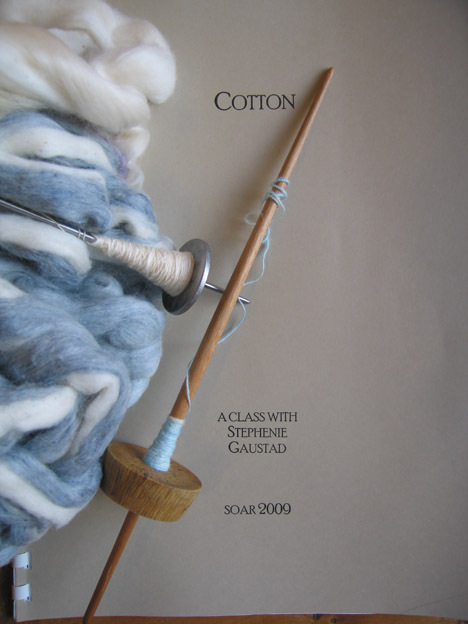 I learned about spinning, and fibre: I learned that I really am a better spinner than I thought, and I was able to get a glimpse of just how much more there is to learn. I learned about teaching: I want to be a mentor, I want to give people the knowledge that they desire. I learned about having fun, in a way that I’ve never had fun before because never before have I been part of a group of women old enough to know what they want and young enough to go for it. But it’s exhausting, physically and mentally. My single room was expensive, but absolutely worth it for me, because I was able to get enough rest (bed at 2130 most nights, I am not joking) and get up early enough to get some exercise. Also: Vitamin C and echinacea+zinc. Placebo effect or not, it may have saved me from the SOAR ‘Crud’, which this year turned out to be H1N1 for many attendees. There’s a group pool of SOAR 2009 photos over on Flickr that’s worth trolling through. What can I show you? Over the three days of the workshop, Stephenie told us about the history of cotton, the varieties, where they come from and how their physical characteristics affect the processing and spinning of their fibre. 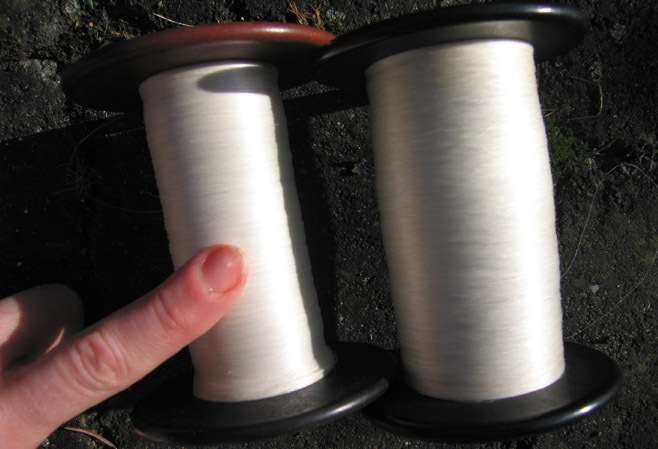 We spun cotton from the seed; we ginned seeds to separate the fibre from the seed, we ‘willowed’ and ‘bowed’ the resulting compressed fibre to see how vibration opens it up for spinning. We carded it and made punis (and a lot of very bad jokes based on Canadian slang. Google it 🙂 We spun our punis and commercially-available Indian punis, we spun top from many cotton varieties and blends. We spun on our wheels (the Journey Wheel was fine), we spun on spindles, tahklis, akhas, southwestern spindles, we spun on box charkhas and banjo charkhas, we spun on bull pups, and a great wheel. While we were spinning, Stephenie passed around samples of handknitted and handwoven cotton to show us what we could do with our handspun. It’s the item Stephenie didn’t bring that is clearest in my memory: her re-creation of Native American weaving for a museum in the southwest, and the look on her face as she spoke of it. Much of the equipment we used was made by Alden Amos (the box charkhas were Bosworths, or from India). Talking with Stephanie about textile history and spindles, she brought out a spindle Alden had made for her, and put it in my hands. How can I describe it to you? Have you ever felt that something was perfect, that it could be no other shape? Light and shadow emphasize the perfection of line and, if it’s something you can touch, you HAVE to touch it because, well, you have to. 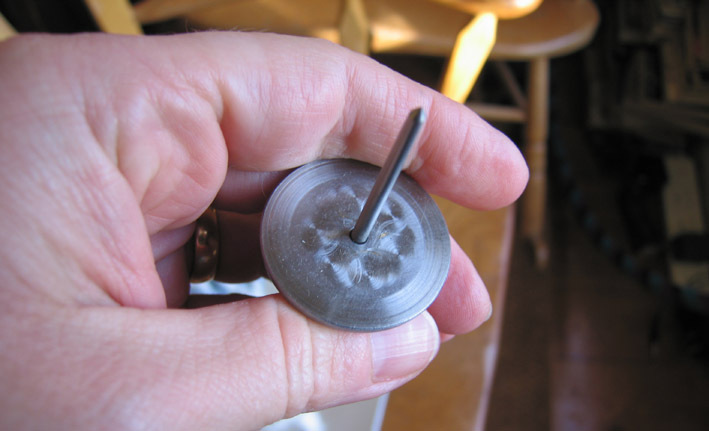 The spindle was not ‘like’ that, it was that. The simple, elegant perfection of the line of the shaft, the grain of the section of wood used as a whorl. I can’t help it, beauty makes me cry, and tears were in my eyes as I handed it back. And then Stephenie gave it back to me to keep. It’s sitting on the desk in front of me as I type, and I look at it and… it still makes me cry. Both for its beauty, and the memories it evokes. Anyway. I also have an AA tahkli. I tried several in the course of the class, and liked this one for its weight and persistance. I can’t think of the right word to describe its insistence on spinning long and fast. Look, it’s got whirlwinds on it! On Wednesday evening the various workshop groups set up displays to show ‘everyone’ what we’d done and what we’d learned. We decided to emphasise the fact that cotton gets a raw deal: it isn’t difficult to spin provided you approach it with an open mind. 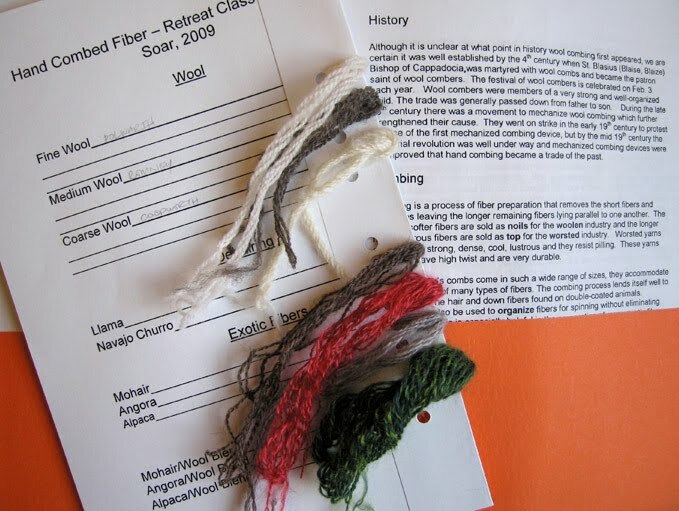 We set out samples of the fibres, the tools we’d used, and the skeins we’d spun. We included ALL the waste fibre discarded over the three days (only a double handful), labelled ‘Cotton is NOT difficult to spin’. 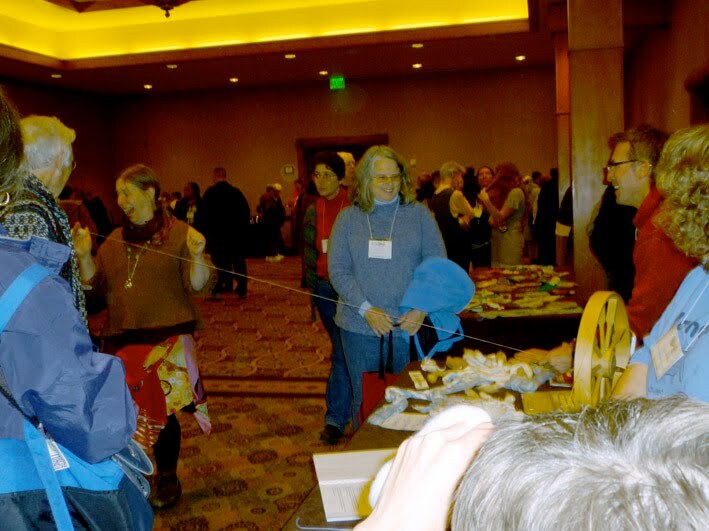 We enthusiastically demonstrated spinning on tahklis (Avedan and Stetson excel at this) and an ordinary wheel. Stetson holds/spins a tahkli while the amazingly talented Denny spins cotton from it. Lyn/enallagma9 (centre), Ellenspn (far right) and others watch, bemused by their teamwork. Stetson I think realised that someone spinning looks a bit… ordinary… sat behind the wheel, so he decided to try something different. At his request I brought the wheel out, turned it so the orifice faced into the room and bent down to adjust something. And the rest is history, recorded on YouTube and the memories of anyone in the room. The purple lump treadling is me; Stetson is the handsome chap who takes a bow after the singles finally gives up the ghost. None of the video and photos I’ve seen so far have caught Denny and the others who were limbo-dancing under the singles, or the moment when my hair got caught in it! Thursday was a rest day, or meant to be. But the Market opened, which was not at all restful. The queue to get in began to form an hour or so beforehand, most of it being the proto-queue for the Rovings booth. The first five minutes were mayhem; I took refuge in Carolina Homespun, whence I emerged considerably richer in Abbybatts and Spirit Trail fibre. I am not saying how much poorer in cash terms! I then surveyed the field. My goal was to acquire stuff I cannot get in the UK, or that is best chosen in person. It was a great pleasure to finally meet Steve of Spindlewood, and I was thrilled to discover that 10g spindle. A Verb for Keeping Warm was on my list; I tried to buy enough fibre that I won’t be immediately frustrated when I run short. The colours are so, so pretty. There’s some Spirit Trail in there, too. 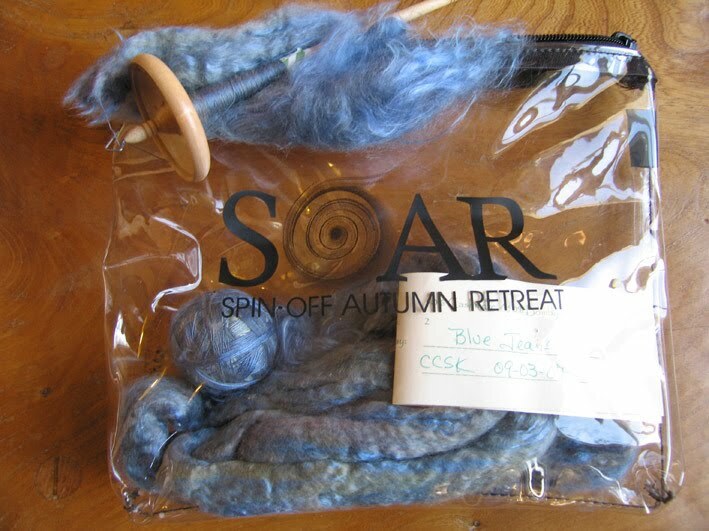 I almost forgot to mention the special SOAR blend. 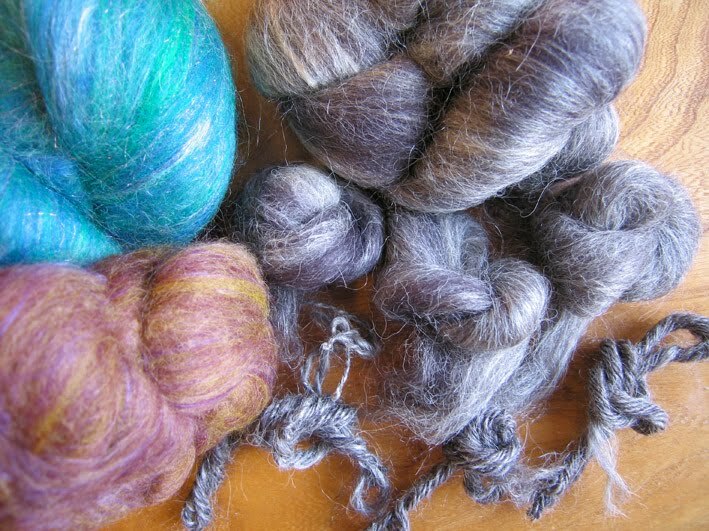 Black BFL and silk, 8oz for $15, limit of three per person. I got three. Also a gift bag from Jimbobspins! There is a lot more fibre, I mean A LOT MORE FIBRE to be revealed. I’m going to ration it in case it overwhelms you, or inspires fibre-holics to raid my house. It’s currently bagged by colour, and there’s the ‘brights’ and the ‘blues’ yet to be revealed. Also the Rovings black polwarth/silk blend. Back to what I learned, rather than what I bought or was given! Friday am was Blending on a Drumcarder with Abby Franquemont. Amazing, intense three hours. 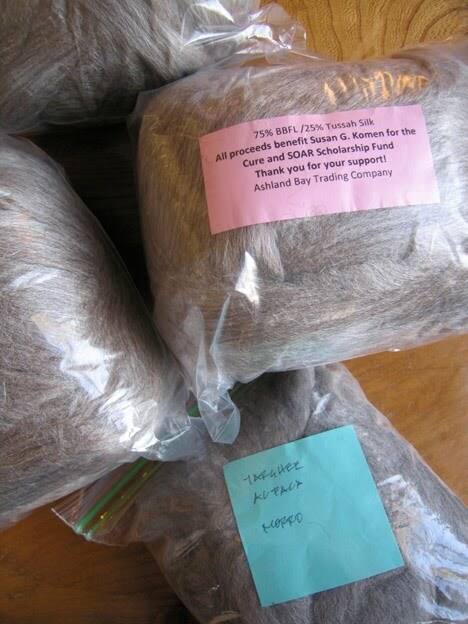 Started with chunks of black merino, silver alpaca, and silk, used to teach us how to feed the carder, how to sandwich slick fibres, and how successive passes make more effective blends. Those tiny twists are my plied samples, one from each pass. 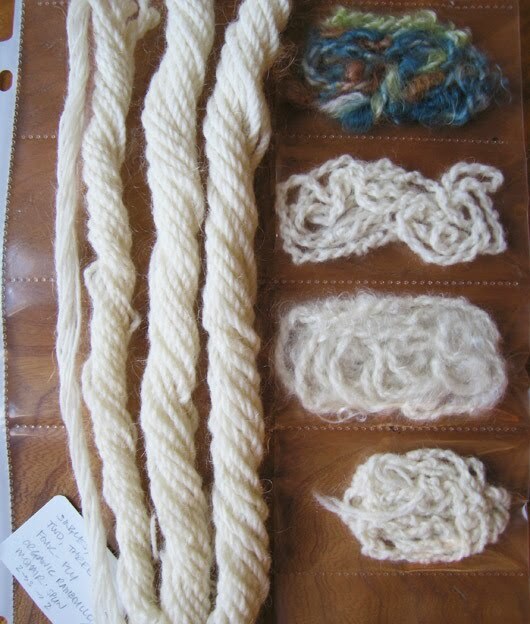 I’ve rarely spindle-spun so fast… We used a range of carders, from small manual to ‘Judith’s carder’, a huge motorised beast that just ate fibre. Don’t worry about presenting the fibre correctly; don’t put your hands anywhere NEAR it! Just toss the fibre at it like flesh to a hungry lion. I was interested to note that the batts from the Strauch were more finely blended, but wow, it was fast. For the next exercise we were given dyed silk. merino and glitz to blend. Not allowed to choose: we learned that even apparently ugly colours can result in lovely blends. My maroon and mustard merino plus lavender silk ended up looking like lavender-shot mahogany. Rather lovely. But now I want a drumcarder. What do I remember most clearly? 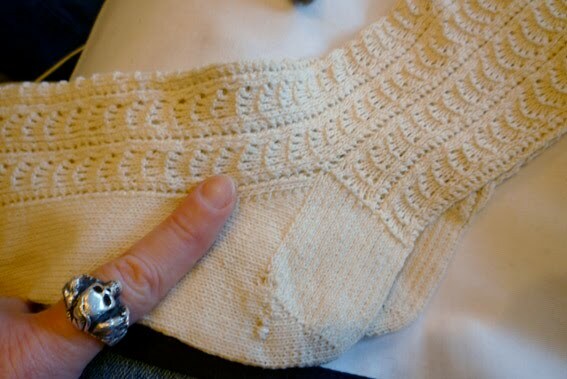 Abby’s hand on mine, pressing down to show me how to feed the fibre into the carder. Knowledge passing from hand to hand. Friday pm was Plying with Judith Mackenzie Mckuin. Slightly less intense, but still… wow. 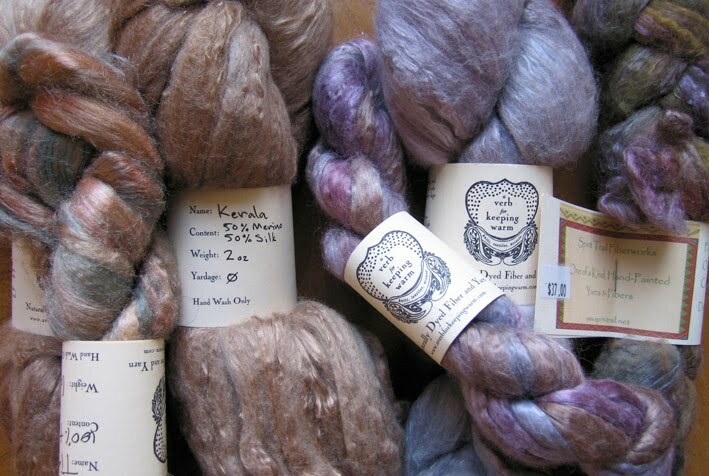 We used millspun singles, Judith’s Rambouillet/Mohair blend, to create 2-ply, 3-ply, and 4-ply. (Judith said my plying was beautiful!) We talked about the benefits of plying and how the structure affects its performance in knitted fabric. And then we played with novelty yarns created by plying. And Judith talked about her work with Native Americans, projects to preserve and pass on their knowledge of fibre. I don’t have any photos from my Saturday am class, American Long Draw with Maggie Casey. I don’t have any samples, save what’s still on the JW bobbin. That’s because I didn’t stop spinning. I learned… my hands learned that my right hand’s habit of pulling forward was causing slubs: the right hand should do nothing but control the twist while my left hand pulls the fibre back and away. And I did the Beerdrinkers’s Long Draw! From the fold or from the end, makes no odds. Should I wish to, I can now drink and spin at the same time. And I got to watch Maggie’s hands, spinning. Saturday pm was Handcombing with Robin Russo. Peter Teal’s precision produces true worsted, but it is possible to produce perfectly useable prep by lashing on fibre as it comes, by the handful. Faster, too. And we did it with a range of fibres on a range of combs, from Navajo Churro on Viking combs (de-hair and comb), Polwarth and Romney on smaller combs, down to angora on mini-combs. See that grey skein on the card? That’s hand-combed, handspun angora. How cool is that? And the red stuff is my first pure mohair. Such fun! But my word, we were tired by the end of it. Saturday evening was Hallowe’en, dinner in costume (I wore my best clothes with button eyes and behaved very properly as the Other Sarah. Which makes no sense unless you’ve seen Coraline) a spin-in of sorts, plus disco/karaoke. Far too loud for me. I went back to my room, changed into my travelling clothes and packed my suitcase bar my toothbrush so I’d have time for a last long pre-breakfast walk before leaving on Sunday. Then I went back to the Great Hall to watch, entranced, as Michael Cook/wormspit demonstrated silk reeling. One of the Sunriver staff leant over his shoulder and I couldn’t help overhearing as he was told he had to clear his workroom within the hour. And I saw his face – he’d been promised the room until Sunday, allowing him to pack all the class equipment. I volunteered to clear it, packing everything onto trolleys (commandeered from the kitchen) to be taken to a different room. When I’d done so (interrupted only by Tsocktsarina’s summons to help give Abby the final installment of the FOAY (Ravelry group) gifts), I was stunned by Michael’s insistence that I accept 2 bobbins of hand-reeled silk, plus 2 empty bobbins, a frictionless clip, and a 3-minute summation of what to do to turn it into laceweight yarn. I’d had to sit on my suitcase (full of fibre) to close it. I’d already thrown away a pair of old socks in order make space… could I fit these in? Of course I could. So I did. 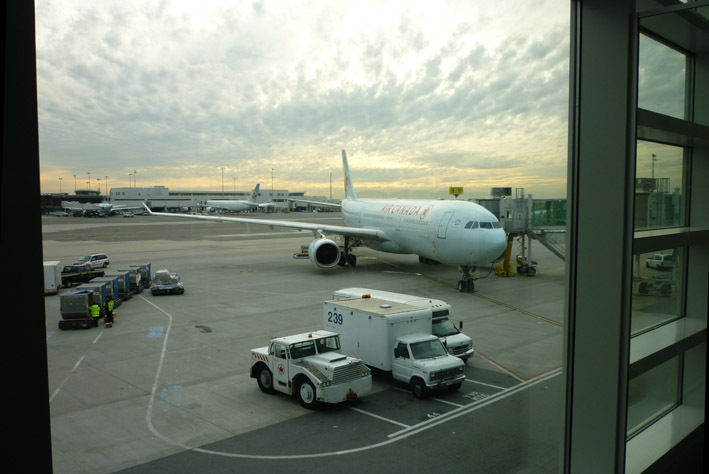 And the suitcase weighed 49lb 8oz on the scales at Redmond Airport on Sunday morning, which is why my right elbow has been Not Quite Right ever since. Very Painful, in fact. But at least it doesn’t stop me spinning. From Redmond I flew to Victoria, where we spent three days with his family before flying back to Heathrow. It hurt to leave, even more than my elbow, it hurt my heart. Western Canada is Home. I console myself with the thought that I carry it with me in my bones, but I still couldn’t bear the view from the windows on the other side of the terminal, the ones that showed the sea and the mountains beyond which lies Home. This entry was posted in Uncategorized on November 15, 2009 by sarahw. What a great post. I've attended SOAR only once, many years ago. Your stories reminded me, again, of why it was such a wonderful experience. Thanks. Thank you so very very much for taking me with you, even if it was vicarious. I don't think I could manage SOAR for a variety of reasons–financial, for one, but I am so pleased you could go. I am also so excited whenever I think of how far you have already travelled as a spinner. I “knew” you before you tried it! PS: Winnipeg is already, in many ways, home. I can see how one could fall in love with this part of the world. Thanks for a nice detailed post about SOAR! Wow. Just… wow. You look adorable treadling like mad with your hands. And that is one IMPRESSIVE single.